With the KidKraft Large Kitchen, the little chef in your home will be busy cooking up some creativity. Designed for children ages three and up, this solid, kid-sized kitchen has all the essentials including: a stove, oven, microwave, sink, and refrigerator. 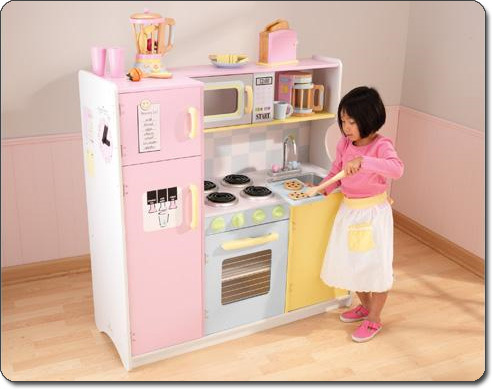 Decked out in bright colors with plenty of gadgets, this kitchen is set up for plenty of imaginative make-believe play. The Good: Plenty of opportunity for imaginative play and "cooking." The Challenging: With so many screws and bolts, a powered screwdriver is recommended. In a Nutshell: A colorful, kid-sized, classic kitchen set. 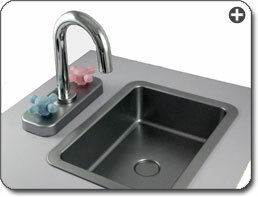 The sink includes cute pink-and-blue knobs. View larger. 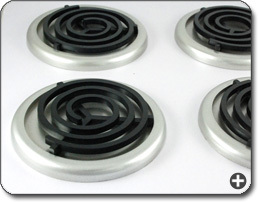 The four-burner stove-top looks just like the real thing! View larger. The Large Kitchen measures 42 x 16 x 42-inches (HxDxW) and weighs 83 pounds -- making it large enough for kids to "cook" without hunching over. This heavy, durable play set will stand up to years of wear and tear. The bright, fluorescent-colored kitchen comes with working doors, knobs, and other gadgets -- such as the clock with its spinning hands. The kitchen's stove top has realistic burners, the oven and microwave both have see-through windows to "check on your food," and the sink is removable for easy clean up. The kitchen also has shelving above the sink for quick and easy storage. Due to the kitchen's size, there is quite a bit of adult assembly required. We would recommend using a powered screwdriver to save time and frustration. The Large Kitchen provides numerous opportunities for interactive and imaginative play. Your child can enjoy making a meal for you, or perhaps "cooking" dinner right alongside you. Since the Large Kitchen is appealing to a wide range of ages, it is a play set that ideal for families with multiple children. Older and younger kids can cook together without being crowded. Kitchen pieces, hardware, and instructions. Designed for children ages three and up, this bright, colorful, kid-sized kitchen includes a stove, oven, microwave and plenty of other gadgets.